After each major event, MacRumors provides a wrapup of rumors to reveal the sources of the most accurate (or inaccurate) information. On September 5th, Apple held a media event which introduced a number of new products and services. These included the iPod Shuffle, iPod Nano, iPod Classic, iPod Touch, WiFi iTunes, iTunes with Ringtone Support, Apple/Starbucks Partnership, 8GB iPhone Price Drop. While watching the keynote, what was striking was how many of the rumors surrouding the event were true. Our Rumor Roundup touched on many of the announcements with reasonable accuracy. The most revealing leaks during this round of rumors surrounded the iPod Nano. From the original mockup and description (“shorter and wider”) by 9to5mac, the new Nano form factor was met with many doubts amongst readers. This attitude persisted even after colors and photos were leaked (and pulled by Apple Legal). The mockup, colors and photos leaked by 9to5Mac all turned about to be accurate. This thing is so fake. It does not have the refine Apple look and the screen aspect ratio is so yesteryear. The interface design is hideous. I don’t know how anyone could pass this off as something Apple would come up. Meanwhile, Apple’s legal involvement in both of these instances reinforces the fact that they have never requested the removal of fakes or mockups. In looking for iPod Touch rumors, we had to go back as far as February 2006 when ThinkSecret first broke the story that Apple was working on a 3.5″ full screen touch iPod. The Video iPod was said to be delayed due to technical issues. 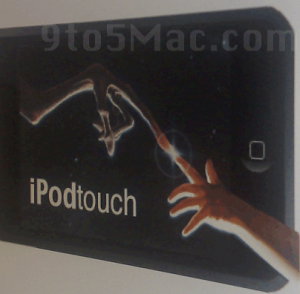 More recent details as well as the “iPod Touch” name itself were leaked by 9to5mac, with an accurate description (with the exception of “thicker”) and mockup. Meanwhile, Digitimes had an accurate report that the touch-screen iPod would come with both Wifi and Flash-based storage. Their industry sources had also previously predicted a 16GB Flash iPod to be due in September, which turned out to be the iPod Touch. Despite hints on the invitation and Beatles album art found all over the user interface videos, no Beatles announcement was made. Steve Jobs said in an interview with USA Today that he hopes the Beatles will launch on iTunes in “the first half of next year”. The NYPost and AlleyInsider accurately predicted Ringtone support. We had originally posted deatils of the Ringtone feature days before the iPhone launch with an accurate description of the cost ($0.99) and clipping tool. – ThinkSecret confirmed the BlackBerry like dimensions of the new Nanos. – Appleinsider accurately predicted a (RED) iPod Shuffle for this event. 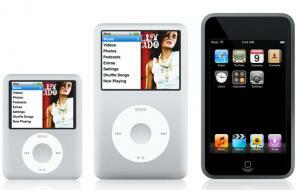 – Samsung’s 160GB 1.8″ Hard Drive announcement did turn out to be relevant with the release of the 160GB iPod Classic. – MacScoop claimed the iPod Touch would be “thinner”. – ThinkSecret predicted the iPod Hi-Fi’s demise. Perhaps the biggest “failure” in the rumor community was a lack of warning of the dramatic price drop that the iPhone saw. In looking back, one rumor may have suggested this possibility. In July, Commercial Times suggested a 2nd generation iPhone would begin shipping in September from $249-$299. More likely, this represented the iPod Touch, as it falls closer to that price range than even the discounted iPhone. As mentioned, most of the rumors were surprisingly accurate, so there were no real “losers” in this round. 9to5mac has continued to provide strikingly accurate predictions of upcoming releases. They previously provided early descriptions of the most recent iMac release. Obviously, future predictions by them should be followed very closely. Of interest, they most recently posted a small blurb indicating that MacBook Pros would see updates in January. DigiTimes is another site who has been consistently accurate in their recent reports. Digitimes had previously had a weak history, but their most recent predictions (Leopard delayed, LED displays, Wifi/Flash iPod) have all come true. As a result, we will continue to pay close attention to future reports from Digitimes.